Stacy McCain did three posts (here, here, and here) over the weekend about the Hoge v. Scmalfeldt peace order ruling and Cabin Boy Bill’s subsequent meltdown. As of 12:01 this morning, my posts on the subject generated about 50 comments. Stacy’s posts generated 125 comments. 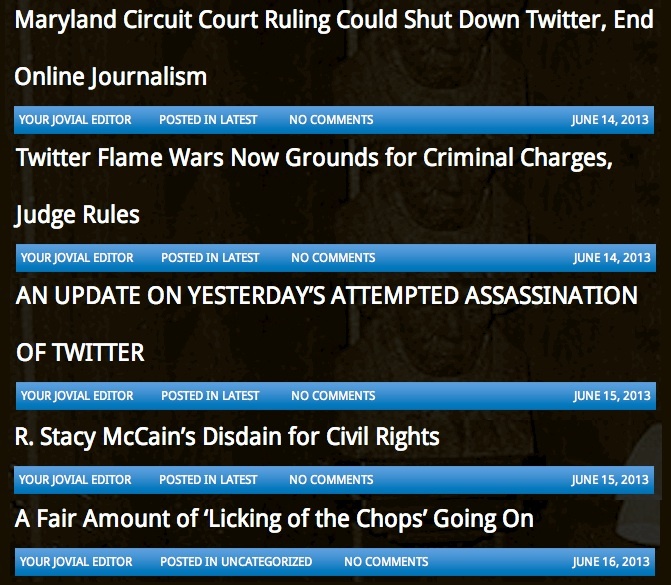 Bill Schmalfeldt has been posting on the same subject at his Patriot-Ombudsman blog (No, I won’t link to it. ), and as of 12:01 this morning, he has had no comments. He can’t even get Texas Tim or Xenophon or Nemesis or Xcitizen10 or Breitbart Unmasked or Occupy Rebellion or Neal Rauhauser or any of the other “supporters” of Team Kimberlin to lend a word of support. It may be that this explains why the Cabin Boy took to commenting on Stacy’s site. The Other McCain has tens of thousands of hits per day, probably over 100X the traffic at Patriot-Ombusman. During the short time that his comments were up at TOM, Schmalfeldt probably engaged more eyeballs that he will for the rest of the year on his own site. While I was on a phone call with a friend on Saturday, the friend told me that Schmalfeldt was beginning to remind him of a 2000 political bumper sticker—Sore Loserman. This entry was posted in Blogging, Team Kimberlin and tagged Cabin Boy Bill Schmalfeldt, Patriot-Ombudsman, Stacy McCain by wjjhoge. Bookmark the permalink.